A dispatch from BLO correspondents in Uganda signals the arrest of the Hon. Abdoul Kalemire III, head of the Bashu chiefdom community, in Beni territory, North Kivu province (DR Congo) at end of this week. He was apprehended by the Ugandan security service when he was attempting to penetrate Ugandan territory through the Kasindi-Bwera border. Chief Kalemire III was reportedly sent to Kampala, the Ugandan capital, where he is being detained pending proper judicial disposition for his case. Indeed, the charges leading to his arrest would be multiple. Among which is his connection to the network of ADF / NALU and involved in the activities of this group of Islamist character. It is important to remember that Chief Kalemire III was the focal point of the spinning organized by the assassins who shot down the late Father Vincent Machozi on 20 March 2016 in Vutungwe. He had deceived the victim by a so-called tricky invitation to participate in a community meeting to reflect on the need for peace and development in his entity, which Fr. Machozi himself originated. Congolese justice had arrested him as the main suspect in the assassination of this servant of God who at the same time held the presidency of his community gathered in a structure called “Kyaghanda”. However, maneuvers organized by the incumbent authorities prevented any credible investigation into the matter. From then on, Chief Kalemire III was under the protection of the authorities who had entrusted him with the task of eliminating Father Machozi. 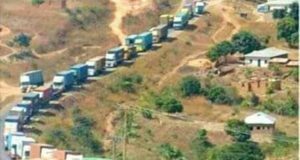 Proved efforts were made by the provincial administration of North Kivu to remove it from the hands of the justice which had already gathered in Butembo. He therefore freely circulated, displaying an attitude of arrogance towards all those who hoped that he would pay for his crime in proportion to the degree of his responsibility in the case. 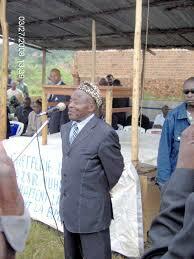 Congolese views are certainly not interested in the reasons that led the Ugandans to arrest Kalemire III. Nevertheless, it is necessary to turn the gaze towards Kampala to follow closely the remuneration of a criminal who has allowed himself the courage to sacrifice the head of so great a community as Kyaghanda Yira, of which he is – himself member. The rest of this file will be postponed over time. Précédent : Detenido en Uganda el jefe local Adboul Kalemire III, a la base del asesinato del Padre Vincent Machozi. 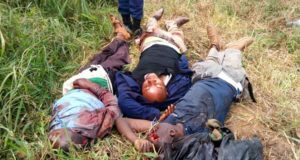 Suivant : BENI-BUTEMBO: Los Bana Mura de Kabila son también tan sanguinarios como los degolladores. I am pleased to see that there is some response to the murder of my friend, classmate, and colleague, Vincent. What a fine human being he was. Always soft-spoken, gentle, but with a vibrant sense of humor. His humility astonishes me still. I knew him for over a year, and we spoke often. But I never knew he was a priest until after his assassination. Vincent was in every way my better: in his education, in his full ordination as a Roman Catholic priest, and his unshakable peace of mind. But in every way, he treated me as an equal, a friend, a confidant, but never as the superior he actually was. His every waking moment was dedicated to the care of his beloved people in his beloved country. As much as this world is a dimmer place for his absence, and I miss him, I am grateful that he lived and died doing what he wanted to do. Thanks so much we appreciate this testimony. Vincent he’s alive via what he believe.